Samsung has shown that it's perfectly able to stick a premium finish on a mid-range handset (as the A series showed), and the Galaxy C5 looks to be continuing that tradition. The phone hasn't been announced yet, but it has been heavily leaked, most recently in a pair of images shared by prolific early-unveiler Steve Hemmerstoffer. The shots provide a clear view of both the front and back of the C5, and it looks more like the iPhone 6S or HTC One A9 than anything Samsung's made lately, with a metal shell and antenna bands running along the top and bottom of the back. The almost square camera lens looks more Samsung though, as does the front of the phone, which has an oblong home button, likely housing a fingerprint scanner. This isn't the first time images have leaked of the Samsung Galaxy C5, so as well as looking convincing in their own right these line up with earlier shots, making them likely genuine. 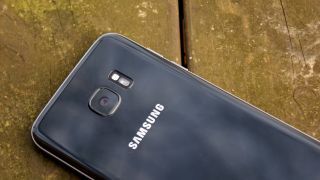 Specs-wise the Galaxy C5 sounds pretty good, with rumors of a 5.2-inch 1080p display, a Snapdragon 617 octa-core processor, 4GB of RAM and Android Marshmallow, which would make for a slight step up from the Samsung Galaxy A5 2016. Given the design and substantial specs the Galaxy C5 could make for an affordable iPhone-alternative, in much the same way as the HTC One A9 did last year. There's no word yet on what the Samsung Galaxy C5 will cost, or when you'll be able to get it, with rumors suggesting the phone is initially set to launch in China; but given how heavily it's been leaked it's likely we'll see an official announcement soon.